Museum of the History of Polish Jews: This new museum empathizes with all those who have fought to exist. The new Museum of the History of Polish Jews is a testament to people everywhere who have fought to exist. 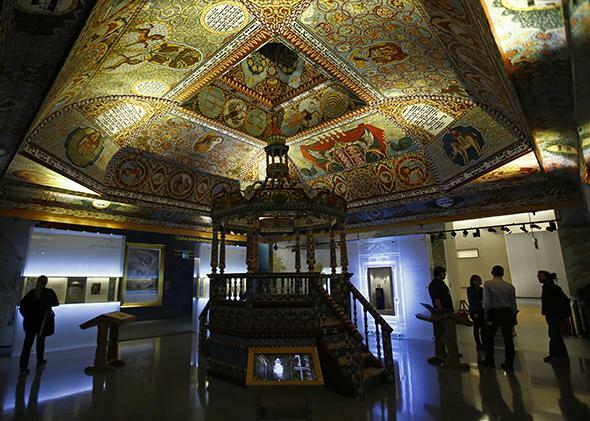 Visitors stand under the “celestial canopy,” a reconstructed painted ceiling of a synagogue that once stood in Gwozdziec (present-day Ukraine) at the Museum of the History of Polish Jews in Warsaw on Oct. 21, 2014. During the war years, Jewish partisans sang a song, which later became the anthem of their resistance movement. It finished with the words Mir zenen do—We are here! After the construction of this museum, today I too, a member of the Jewish community in Poland, want to repeat after them: Mir zenen do—We are here! After he spoke, Turski, 88, took the arm of a 13-year-old Polish Jewish girl, and the two of them—representatives of an old and new generation of Polish Jews—symbolically opened the museum doors. For those who live in larger nations, I’m not sure that this emotion is even comprehensible. Certainly the insistent declaration “we are here” isn’t part of any big nation’s national anthem. Americans sing about “the land of the free and the home of the brave.” The British sing, “God save the Queen.” The French sing, “The day of glory has arrived.” None of them sing in order to prove that they haven’t been wiped out altogether. But those who live in small nations can perhaps empathize with one another somewhat better. If nothing else, Warsaw’s new museum shows that the history of Poland is almost impossible to understand without the Jews who played such an important role in it; that the history of the Jews is almost impossible to understand without Poland, where so many of them lived, and flourished, for so many centuries; and that, despite what happened in the 20th century, we are all still here to remember it. I hope the museum, and the people who will visit it, can help that empathy grow.